Sheep Hills is a locality in the northern Wimmera region, north-west Victoria. It is on the railway line south-east of Warracknabeal, about midway between there and Minyip. Sheep Hills was the name of a pastoral run taken up in 1847 by Archibald McMillan. Farm allotments were taken up in the mid-1870s, several of the settlers being of a German-Lutheran tradition. 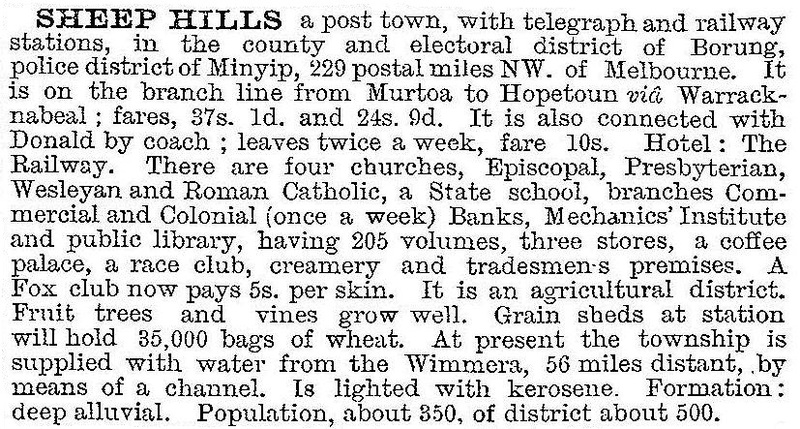 The Sheep Hills district was known as Bangerang (the name of a Lutheran school) and Tarkedia (the name of a State school opened in 1877). In 1886 the railway was extended from Minyip to Warracknabeal and the settlement which grew at the railway siding was named Sheep Hills. A mechanics’ institute was opened in 1888, and within a few years there were a hotel and several stores. Water was supplied by a channel from the Yarriambiack Creek. There were also Anglican, Catholic, Methodist and Presbyterian churches, the Lutheran community apparently worshipping at Kirchheim, near Minyip. The replacement of horse drawn and rail transport by motorised road haulage caused a gradual decline in the businesses at Sheep Hills. The school was closed in 1985 but the mechanics’ institute remains as the locality’s prominent building. Sheep Hills homestead, an elaborately built structure (1866) was removed in 1953 and the Anglican church building (1889) was moved to Halls Gap in 1970. The Sheep Hills Cup is run annually at the Warracknabeal racecourse. Graincorp bulk grain silos at Sheep Hills were closed in 2003.